Venice High School "Red Devils"
The History of Venice and its High School "Red Devils"
Venice (population 2,528) is a town located in southwestern Illinois along the Mississippi River on Il. Route 3 approximately 4 miles northwest of East St. Louis. The Norfolk Southern Railroad and the Terminal Rail Road Association, or TRRA as most know it, of St. Louis Railroads run through the city. It is located in western Madison County. Venice was visited by Sen. Estes Kefauver, 1951; Adlai Stevenson, 1956; Jack Kennedy, 1960, Harry Truman, 1952; Gypsy Rose Lee (Several times in the 1940s & 1950s). Venice is the site of the second bridge to span the Mississippi River at St. Louis, MO...the McKinley Bridge, 1910 and Merchants TRRA Bridge, 1886. Venice was the home of the worlds largest electric producing plant, 1905. The town of Venice has a very long history of education. 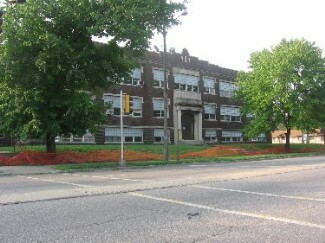 The high school was established in 1917. It served the community for nearly nine decades before closing. 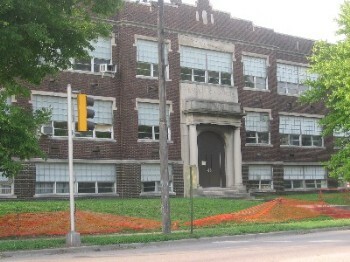 Financial distress, school building safety issues, and population decline are a few of the reasons cited for its closure. The closure became a reality in 2004. 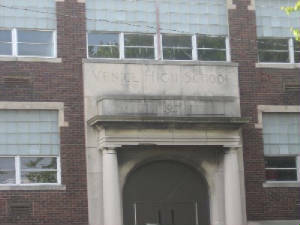 "Venice High School" Inscription - "1917"
A charter school was established to continue the education of the Venice students. The high school building in Venice eventually fell into a very poor condition and became unsafe for use. 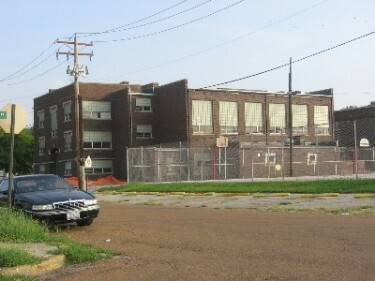 The Venice High School building, gymnasium, and grade school buildings have all been torn down. "The rights protected Venice High School DVD is ready for sale!! The price is $15.00 each. There are two versions of Vol 1. The PC version which has all of the extras. THIS VERSION REQUIRES A DVD PLAYER ON Y0UR COMPUTER. and the TV version which is played on most any DVD player attached to your TV. So, what's the difference? No extras are included on the DVD-TV version. But, it plays just like movie and is easier. For those not accustomed to using, or without a computer with a DVD reader, its the only choice. Our suggestion, buy both in case you come across someone with a computer to take a look at it. We've made the Vol. 1 Edition as inexpensive as possible. Volume 2 is the newest news we're introducing and it's much larger and uses FOUR total discs. Volume 2 tells about our town in small stories of the times we know you will rejoice in remembering as you tell your grandkids what a wonderful place Venice was for us. Vol. 2 costs $35 for the set of four discs. Seems like everyone has taken a fancy to Vol 2 and we suggest you do not delay in getting your copy because there isn't any better time than right now. Our contact person is the same: Jim Jeffries, Sec/Treas of the Venice History Committee. Only disc 3 of Vol 2 requires a computer but all four discs will run on computer if you wish, while discs 1, 2 and 4 run on your TV. This really means everything is entirely researchable. To name some items Vol 2 set includes: all collected photos, all yearbooks we could obtain, VGS Junior Journal school news, all school photos 1924-2002, all newspapers from the Venice Herald over three years 1926-28, reunion booklets, all recorded audio interviews, all prayer cards and memorials, a comprehensive collection of Venice teachers, all records of the old Venice cemeteries, the complete story of the Venice History Committee and members, Don Davinroy's Cafeteria Recipes, a comprehensive list of all graduates 1917-2002, all written Venice histories known to us, all new twenty plus stories and the Venice book, should you wish to print it out. The new Venice Sports Hall of Fame information is collected into disc 2 complete with the first VHS championship game in 1975. Disc 3 contains the Venice Ghost Stories, video interviews and several collected home movies. Its important to note that Vol 2 is completely separate from Vol. 1 and to have the full collection is to have both volumes, 1 & 2. The PC Vol 1 extras include all of the written memories given to us by various people, newspaper articles about Venice, a copy of the 1927 Venice Herald (one of our own newspapers,) A printable copy of the complete written story script with all the discovery documents we came across during the seven years, and a list of major contributors, a list of the Venice History Committee members, the Windjammers from 1956, the 1958 Venetian, the 1978 Deviltorian, A listing of Venice deceased from classes in the '50's forward, etc., and last but not least, a set of class pics 1924 through 1965. Please send a check made to Jim Jeffries, Venice History Committee. PLEASE INDICATE WHICH VERSION YOU ARE ORDERING. FYI.... NO ONE makes a profit from the DVD sales. After expenses, all monies goes to the Venice projects selected by the History Committee. Examples: The St. Marks bell project and the Venice Duck project. Other projects are also financed as accepted." To view information on VENICE LINCOLN HIGH SCHOOL please left click here. There was very little information regarding athletic teams other than boy's basketball available on the IHSA web site regarding Venice High School. In fact only boy's track and field warranted a mention besides boy's basketball on the site. HOWEVER what an incredible run the Venice Boy's Basketball team had over the years. It is not clear what other sports were offered at Venice besides Boy's Basketball and Boy's Track. We do know that baseball was offered and football was offered at one time. The INCREDIBLE successes of the boy's basketball team are listed below. * TWO CLASS A STATE CHAMPIONSHIPS!!! IHSA CLASS 'A' STATE CHAMPIONS! First row kneeling: Jesse Hall, Vincent Harris, Wilfred Wigfall, Dale Turner Jr.
Venice Basketball Statistics "By The Numbers"
107 - Number of points Venice scored despite losing against St. Louis Central in a game on February 15, 1980. Central had 129. 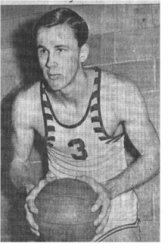 60 - Bob Dubinick's point total in a game against Trenton on January 19, 1951. He scored 27 field goals and made six free throws. 48 - The margin of victory in the 1987 State Basketball tournament against Pearl City, in which the Red Devils beat the Wolves 81-33: the largest margin of victory at the state tournament in all levels. 42 - Number of steals Venice accounted for in the 1987 State Basketball tournament, another all-time high. 19 - Number of steals Venice had in their state game against Pearl City. 7 - Players who scored 10+ points in a game against Worden on December 3, 1987. 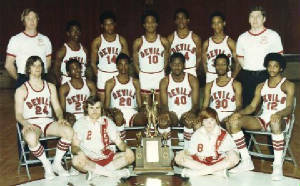 3 - Number of overtimes the Red Devils survived in order to beat Carmi in the 1975 Super-Sectional. *Venice beat West Frankfort in the St.Louis Area Shootout in 1986 by the score of 59 - 44. Largest average margin of victory. Best Field Goal Average per game. Two boys brought home IHSA medals from the State Class 'A' Track Meet. 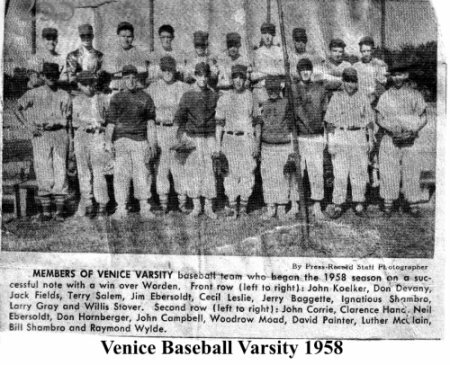 "Venice baseball was centered around our two high schools, VHS and Lincoln. Players usually had less than ten games per season at either school. Thus, to become a better player, we were compelled to go to summer leagues, if we could. We had fine players but usually we didn't get the extended coaching or the summer leagues for development and with those limitations. Consequently, no matter how good your basic equipment was, the opportunities were very limited. In spite of many things that may represent racial isolation, during the summers, many ballplayers from basketball and baseball played their particular sport together without regard to color. During the summers, we were all friends. Ted Savage and Willie "Rainey" Crawford. Both men were outfielders. Ted was a resident of the Island for years and played for Lincoln. 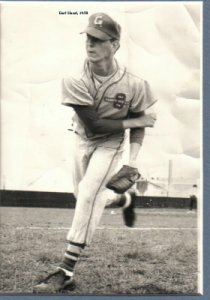 Rainey played independent ball with Hawk Devany, Burl Hand, Clarence Hand, myself (Donn Hornberger) as well as several others in the immediate area. Rainey lived in North Venice and Brooklyn, as I recall. Both Rainey and Ted had very nice careers in professional baseball. Fred Rumpf a product of VHS baseball (catcher), went to SIU/Carbondale on scholarship and may have been a professional player with the St. Louis Cardinals but illness prevented that potential. Never the less, to my knowledge, Fred, as far as I am aware, is the only VHS player ever to go to college on a baseball scholarship." There was a football program at Vinice High School at one time. The photo to the right is Venice High School football player James Jeffries taken in 1937. If you have any further information on the Venice High School grid iron greats please forward it to us for inclusion in this portion of the page. There were four tennis courts for the entire town of Venice. Of all that played tennis at VHS, only one player, Donn Hornberger, ever played for a college. Donn continued his education after leaving Venice HS at McKendree College. Like many small towns, the best tennis players had little opportunity for development. As a consequence, tennis was a occasional summer past time and most missed the juniors circuit, which is a very necessary step for all developing young players. VHS's Donn Hornberger, would go on coach the sport of tennis in his adult life. As with most schools, the boys' successes on the court were often helped by the enthusiastic cheers from those in the crowd. 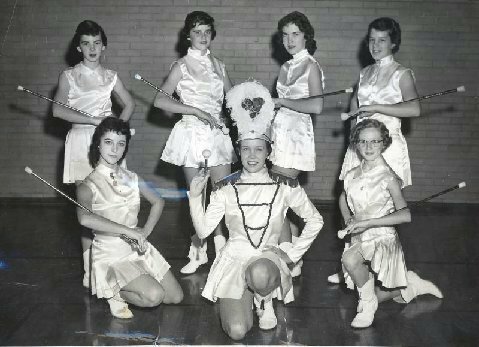 The cheers for the Red Devils were led by cheerleaders and majorettes who worked very hard at perfecting their routines making the Venice High School games even that much more enjoyable! "I am a '58 graduate of Venice HS and played with Bill Ohlendorf who was one year ahead of me in school. In my opinion, he was probably the best all around athlete ever to graduate from Venice. Bill was a great outside shooter and would have scored many more points if we would have had the 3-pt. line at that time. Bill, who is now deceased, was a best friend of mine and graduated from Erskine College, SC where he attended on a basketball scholarship. He also played on the baseball team, and learned how to play golf. He was an excellent golfer in his later years. After Bill graduated from Erskine, he took the position of gym teacher/coach (all sports) after a great and kind man by the name of Zahn Wells. Coach Wells was a graduate of Murray State College, Murray, KY and played on their basketball team. He and his wife Cleo, spent their careers in Venice." Read much more of Coach Ohlendorf's bio from Don Davinroy at the bottom of this page. "I was a coach at Venice HS during the years 1972-75 and again from 1977-1983. I assisted Bill Ohlendorf in 72-73 when we got 3rd in the Class A boys' basketball tournament. I was on the bench in Champaign when we won the state championship in '75 under Rich Essington. I left to become an assistant basketball coach at Oakland City College (IN) from 1975-77, but came back to VHS in 1977. We never had outstanding size during the years I coached at Venice -- in fact, the last year (82-83) we had no starters over 5'9" tall, yet beat some of the areas teams with tremendous size. 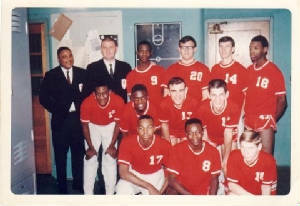 During my tenure I had some wonderful ball players (Reggie Mathis-guard, Ronnie Salmond- center, Donald Gardner- forward, Archie Gardner- forward, William Watts- guard, Keith Marchbanks- forward, James Matkins- guard, Harold "Smokey" Milton- forward, Eddie Salmond, Jr- guard, Phillip White- guard/forward). In addition to coaching basketball, I also coached boys baseball for three years, then was asked to resurrect the girls sports program. So I coached girls' volleyball and softball for several years. Venice High School was a very special place back in those years and it was a joy to teach and coach there. One of my fondest memories of any one player's performances was in 1982 when we went to Vashon HS in St. Louis to play a Floyd Irons' team that would go on to win the Missouri state championship. Eddie Salmond, Jr, a 5' 7" guard, tossed in 44 points against a very tall (6'4" guards, 6'6" avg front line) Vashon team before the 3 point line was established. One of the greatest individual performances I ever saw." 1983-84 - 1990-91 Eight Consecutive 20+ game winning seasons. Erwin Claggett, Jesse Hall, Fessor Gray, Bob Dubinick, Jeff Corrie, Rich Essington, Mike Henry and his brother Ron Henry, Reggie Gardner, John Earl Campbell, Bill Ohlendorf, (also listed above as Great Coach), Clarence (and Clarence was assistant to Rich Essington in the first championship year, 1975-76) and his older brother, Burl Hand. And, around these great players, were the team mates that made them great. *Jesse Hall- On 1987 state championship team, played college basketball at Michigan State University, won Litchfield Tourney MVP, also in Litchfield Tourney holds the record for most field goals with 17, highest FG per game ave. with 13.3. *Dale Turner- Played college basketball for Northern Iowa. Was the point guard for UNI when they upset Missouri in the First Round of the NCAA tournament in 1990. Dale has been named the head basketball coach at Madison High School for the 2008-09 season! *Erwin Claggett- Played college basketball at Saint Louis University. 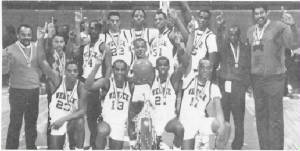 *In 1986 (Sweet Sixteen) and 1987 (State Champs) the great Venice teams defeated perennial national power St. Louis Vashon (led by Anthony Bonner) both years in a home and home series. The games and rivalries with Madison and Lebanon were tremendous and intense. Another game of note was during the mid 1980s playing against East St. Louis Lincoln and LaPhonso Ellis when Ellis shattered a backboard on a slamdunk. 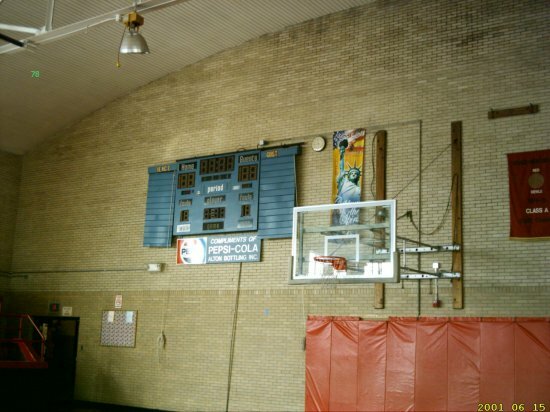 The game was delayed while a new backboard was retrieved from Madison High School. Even though Bill was baptized Catholic, he attended the public school in Venice. I attended St. Mark's Catholic school and so our paths didn't cross until I was in the seventh grade. 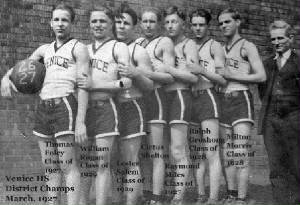 We had a basketball team and was entered in a Catholic boys basketball tournament somewhere in Springfield, IL. Being a 7th or 8th grade Catholic boy was the only requirement, so our coach drafted Bill and another public school player to play on our mediocre team. Well, we won the tournament, and I think that Bill was the MVP. The next time we were together was with the boy scouts, and I remember him being "tapped" as an Eagle Scout which was quite an honor back then. Like I said, he was probably the best to come out of VHS. He could play most everything, and play it well. He played tennis, swam, played pool, corkball, horseshoes, etc. Bill lettered in HS baseball mostly as a third baseman and pitcher. He also lettered in track with the pole vault and high jump. If we would have had a football team, he would have been the star quarterback. I believe that he was the '57 class Valedictorian and played in the band. He wasn't a necessary natural, but he worked at it and learned. By the time he left Venice, I was convinced that he was a great coach -- probably better at coaching than playing. His early teams didn't have a great deal of talent, but he tried. He would scout opponents by himself, with someone else (usually me), or send me to scout. Since I was a certified referee, he would have me call his scrimmage games. He understood that many officials have their own "quirks," and he would tell me each time which violation he wanted me to emphasize. One time it would be traveling, or 3-sec. in the lane, or moving screens, etc. When his team would play in the Freeburg/Columbia Christmas tournaments they would sometimes give him with a 9 a.m. game. He would practice 2-3 days prior to the tournament at 9 a.m. to get his players accustomed to playing at that time of day, and on the day of the game he would have the players meet in the Venice HS home ec. room where he and I would fix them a good breakfast. His luck changed for the better when Venice and Lincoln integrated. He now had additional talent, and most small schools couldn't beat him. However, he didn't live on that. He scheduled as many large schools on both sides of the river that he could, and set a precedent for later coaches. At the beginning, Bill had a pair of "lucky" boxer shorts that not many people knew about. He wore them on game days until I guess they just plain wore out. Many times he would get me up around 4 a.m. on the day of the first game because he couldn't sleep. We would drive around, have breakfast, and all the time talking basketball. I would help him when he needed me, and one time during a district final with a local school, he asked me to join him on the bench. I felt good that he needed my input, but only to find out later that he wanted me to watch the crowd because he had received several death threats. How's that for friendship!!! I was with him during his run that year when he won games he probably shouldn't have. We lost in the playoffs to the eventual champ, and really had no business beating St. Anne, but he did. Bill knew that he had a special bunch of players as freshmen in the Fall of 1972. Normally VHS didn't play a "freshman" schedule, but that year he asked me to be their coach. I don't think that we lost a game. That team as Seniors won the State Tournament in 1975. Bill wanted a chance to coach on a different level, so he resigned his VHS position and took the position of head basketball coach, Granite City North High School in the Fall of 1973. Bill had that kind of personality that everybody liked. He had his basketball friends, coach friends, referee friends, golfing friends, pony friends, work friends, Venice friends, GC friends, etc., and of course his extended family. If Bill was going to be at an event, you knew that there would be a good time. We all miss him dearly. "Venice had some very good baseball players. Most of those players were also good in basketball. Once, we even had a good football team. That only ended after the WW2 years. In baseball, we had some winning years but we never played many games often limited to about ten games per year. The two best baseball players I recall were Devany and Burl Hand. I was ok but just barely. Bob Dubinick was a great player, to be sure. One great player that remained for the full treck and beyond, and I believe that pound for pound, inch for inch, he was (one of) the better ... VHS player(s) of all time for the Venice I recall, 1950-1975 and that's Rich Essington. He had all the moves, down the lane, either side, either hand, inside/outside. Very quick and aware with great ball handling skills. 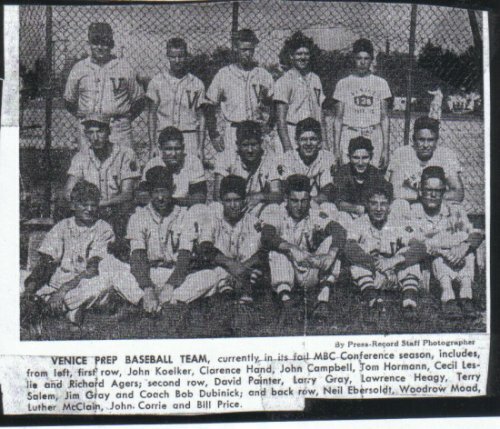 Venice High School could've won State as early as 1950 with integration. We should've won it many times." 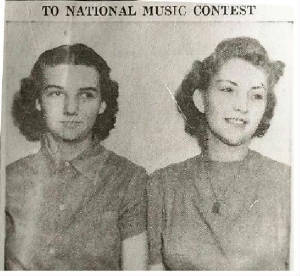 "Virginia Burns, saxaphonist, left, and Mae Scott, flutist, Venice High School seniors who won the right to compete in a national music contestto be held May 17. 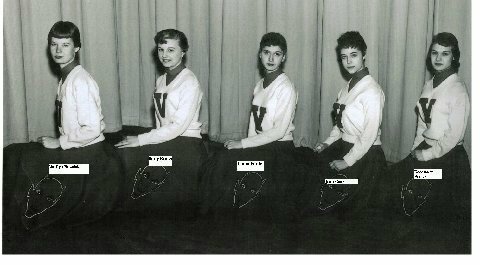 They have been members of the Venice band six years." 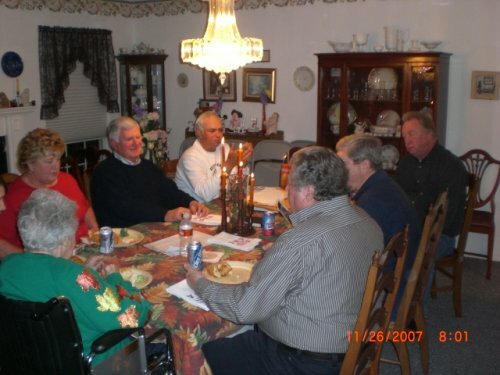 "Lawyers, Engineers, Social workers, Educators, business men, Capts of Industry, significant military members: John Hogan, Bill Hoover, Bill Price, Terry Greenlee, Jack Bettag, Mike Lopez, Steve Lopez, Dr. David Weber (EPA,research director), Dave Painter (GCHS Principal, Class of 1959, VHS); Others include Fred Kohl (industrialist), Harry Hartman(noted ATTY), Al Pace (businessman), Sam Wolf (IL Congressional Rep 25 yrs), Jim Daniels (25 yrs, Section Director, ILDptofTransportation), Lester Salem(VHSBoard President), Tom Foley, Sr (city father), Bill Ohlendorf (VHS first district championship), Rich Essington (first state championship), Bob Dubinick(educator and 60pt game honors), Jim Jeffries (first Principal), Terry Salem (second principal), Phil Smith (Administrative Asst to Regional Supt), Don Davinroy (principal), John Lee,sr and jr,(physician, dentist and mayors), Frank and Jim Reidelberger (mayor and county probation director), Bruce Groshong (federal probation/marshall), Harold Koelker (DEA agent), LLoyd Paterson (DEA Agent), Dr. Ted Savage (pro baseball and educator), Rainey Crawford (United Nations ambassador and probaseball), Jack Tolliver (town father and AmerLeg director) , Rogera Davis (performer Norman Luboff Choir), Bill Schaefer (autoracing champ), Milton Morris (town father and industrialist), Fa. Peter Paul Kaenders (Playright and priest), Donn Hornberger (writer and musician), Althea Cross (educator), Registered Nurses Barbara Chalfin, Ina Mae Cockrill, Janet Robertson, Becky Schaffner, Ms. Marquerite Fechte (Venice resident and VHS nurse), Lucia Saucier Foley (1936), Delores Robbs Stalecker (1947), Kathryn Robbs Kowalski (1950), This list barely scrapes the numbers of outstanding achievers." "Racing Section of VHS sportsmen. 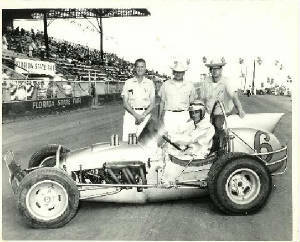 Driving Champion Bill Schaeffer, to the right as you look at him in the photo below. This is his family's sponsored car. Bill had many wild rides in many racing cars." **Ms. Angeline Yvonne Turner - Venice resident - first African American female firefighter in the Tri Cities, also served in the US Army 2004-2009.